B2ST s Doojoon and A Pink s NaEun were recently spotted at a club. On December 4th, some pictures were uploaded online showing Doojoon and NaEun getting fun and wild in a club. These pictures were actually previews for the upcoming movie ‘Marrying the Mafia 5: The Return of the Family. 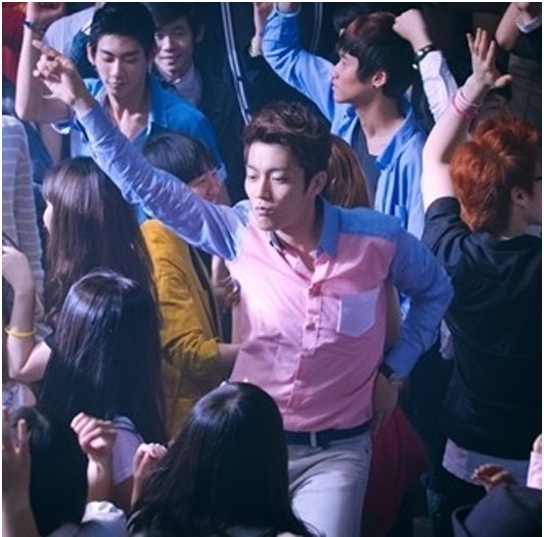 In the scene, Young Min (Doojoon) shows hesitation and sbashfulness as Hee Jae (NaEun) begins to seductively dance in front of him. However, he soon gets down with the music and showcases his comic dancing skills. ‘Marrying the Mafia 5: The Return of the Family is a comedy film about things happened as Dae Seo (played by Jung Jun Ho), who used to be considered as a good luck in the mafia family, suddenly becomes a bad luck. The film will premiere on December 19.